I found the white noise therapy very unpractical, since you expose yourself to loud noises without protection. I have seen on the hyperacusis-research website, that there is a new tool in development, which should provide white noise and keep loud noises (and fast rising ones) away. Since this device will be available in a few years from now on, the following idea came to me. *White noise generator alone is not a protection from loud noises. I simply but a hole into a 30db foam earplug with a toothpick. I put away the endcap from the noiser and put the transparent cable in the created hole. The result is quite good. The white noise will be more a brown noise now, due to the high frequency filter. It protects me from noise, without understimulating my ear. I am testing it now since one week, and I can stand my office. Its not perfect, but it can help. I hope this is helpful for your. WhT is the price for 2 years, the ear generator work by charging? What is the name of the product of the n g? 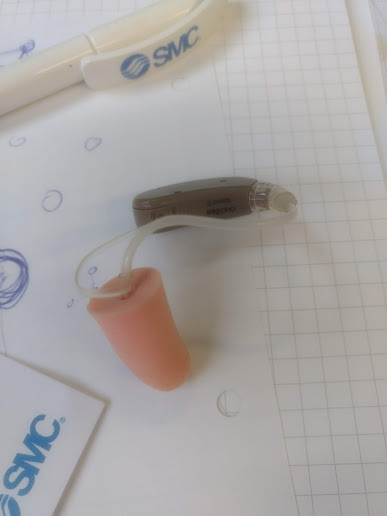 the model is called audifon sueno s.
I bought them for 1000€ two years ago, they run with hearing-aid batteries. This model is not adjustable, there are other models available from audifon. I have Resound hearing aids, and wonder if I removed the domes and attached the earplugs as described with the app for white noise; would this work? Why are you wearing the plugs? Do you have sound induced pain with T, or is your hearing abnormal? Do you hear everything too loud/amplified, including voices and frequencies? I am asking because people seem to have different types of issues. My issues are T and LOUDNESS H. My pain seems to have subsided. I am trying to find something different that works for me. White noise generators alone I could not tolerate. To anyone on this thread - Use PINK noise only! A combination of pink noise saturation and meditation brought two terrible months of hyperacusis suffering to an end. Try it! I had an acoustic shock 4 years ago, my left ear is damaged. The trigemnius nerve hurts a lot, and my tongue is cramping due to that event. I was a music producer and I was sitting too near and too long in front of a speaker. A high frequency tone destroyed my inner ear' higher frequencies. 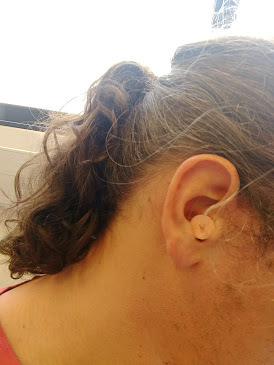 At the acustic shock my left ear felt like there was something cut away from the inner ears protection. My hearing is more or less normal, I can hear the damaged frequencies in silent (which i try to be in my free time). It sounds like "beep-beep", rhythmically. My right ear is actually normal and not affected, also by loud sounds. I don't hear sounds too loud or amplified, they let my left ear feel bad, uncomfortable and painful. I can tolerate a converstations without plugs, but I have to limit myself to the time of that. I can feel how my ear gets inflammed over the exposure time. In the morning I feel not a lot of pain and the more noise the more pain I get. My left ear feels very tightened. My left ear also spasms, when I hear something metallic or fast rising in amplidude - like a dish clanking, it feels like it cramps. I wear this combination because I have to work in a room with 20 other people. Its a big room and people make noise. I feel very uncomfortable when I wear no plugs or just the noiser. I concentrate at my work and when somebody is hitting a trash can for example, my hole body gets into stress. And this goes on for 8 hours. So I started to wear plugs, but they don't really work, because it still makes me feel stressed when I hear this fast rising noises. When I wear the plugs and the noiser I can calm down a bit and the WNG overlap the most of the clanking office noises. Its hard to understand people talking with this setup, I have to shut down the noiser when I want to understand them. I have tried to cure my hyperacusis with white noise alone for over 1 year, and I had actually no improvement. For me this device is just a masker. I hope I could help you with that, it is much less intense as white noise. Thank you chris for your comment, I had tried pink/white noise for a very long time, unfortunately without success. I think your setup makes good sense. It’s brilliant! 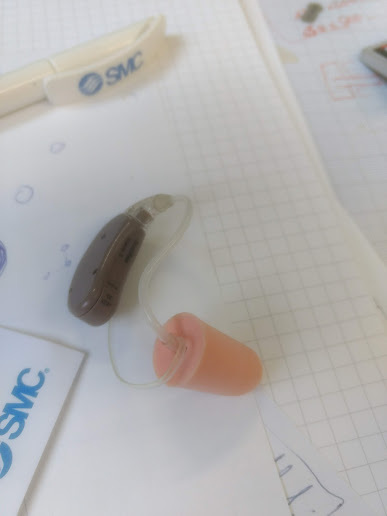 I’m personally reluctant to use earplugs because of the feeling of them, but if I had to work in a place with noises happening, I would definitely try this. The reason I don’t wear the noisers is that I can’t protect myself from the many loud noises that happen in my daily life. These are things that gave me hyperacusis in the first place! Now, when I’m on a walk I put my fingers in my ears when I hear sirens, lawn equipment, loud fast trucks, loud voices, etc. I do need to block these things out. Thank you Florian for posting. Good to know that it is working for you, so you have a way to move forward!